This often used short hand phrase for customer focus has been a great way to simplify the message that customers are important. The reality is more complex, we know the customer is not always right for our business. 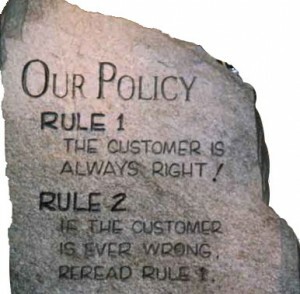 There are customers that will take advantage of policies, loopholes and mistakes we make. Some customers are abusive and create stress for employees. In short some customers need to be fired, but these are exceptions not the rule and should not guide the way we treat all customers. We also know that customer’s can’t really tell you what they want until they see it. However, the sentiment is useful and it does serve to help us remember why we are in business. Ultimately the customer decides whether we are successful or not, they pay the bills and their perception is reality. Its not uncommon for us to have different views than our customers, in fact, it is normal, we have different experiences, backgrounds and perspectives. The key is to not lose sight of why we are doing what we are doing. By remembering the customer is always right we can remain focused on getting it right for the customer. This entry was posted in Customer Centric Culture, customer focus, Customer-Centricity and tagged customer focus; culture change; emotional drivers of culture change; customer centricity. Bookmark the permalink.